Samsung's new Galaxy S7 Active is a toughened-up version of the flagship Galaxy S7 that won't fail if dropped on the ground or in water. The Android smartphone has a 5.1-inch screen with a 2560 x 1440 pixel resolution, and 32GB of storage. It sports a 12-megapixel rear-facing camera and a 5-megapixel front camera. It also has a fingerprint reader, and support for Samsung Pay. 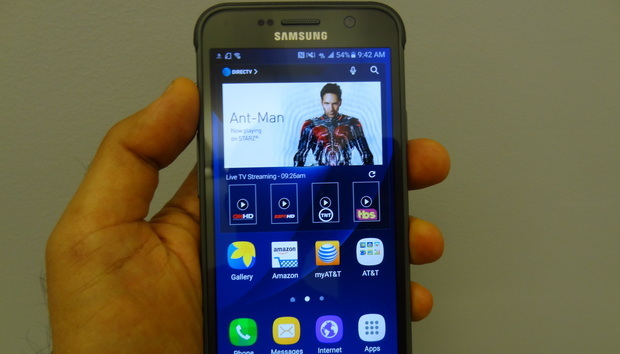 The smartphone will be available through AT&T on June 10. You can shell out US$794.99 for the handset, or buy it via AT&T Next, which cuts the price of phones down into monthly installments. AT&T Next also provides options to upgrade the handset at certain intervals. I subjected the phone to rigorous torture tests. It withstood a six-and-a-half foot (two-meter) drop to a concrete floor, and there wasn't a scratch on the screen. It survived unscathed after I dropped it into a vertical, glass-encased, five-foot obstacle course that Samsung set up for demo purposes, featuring steel bars that the phone smashed into on the way down. And it was still working after it was immersed in a small bucket of water for a few minutes. The Galaxy S7 Active has a Gorilla Glass 4 screen, much like the Galaxy S7, but with a polycarbonate layer that gives it extra protection. The handset can remain immersed in up to five feet of water for 30 minutes, according to Samsung. The handset could be useful for clumsy folks like me with a penchant for dropping smartphones. I own a Moto G smartphone for that very reason; it doesn't break easily when dropped or bent. The S7 Active isn't as sleek as the S7. It is 9.9-millimeters thick, and slightly longer on the top and bottom, all of which adds to the durability of the handset. It's as if Samsung integrated a case directly onto the smartphone. The Galaxy S7 Active also has a thin layer of protective bumpers on the curvy corner edges. A Samsung spokesperson surmised the layers are made of some kind of metal, though they felt rubbery on touch. If you were wondering -- the phone didn't break when I bent it. No iPhone-style "Bend-gate" controversy here. At 185 grams, the smartphone is heavier than the Galaxy S7, which weighs 152 grams. The smartphone has three function buttons under the screen; that's different from the flagship S7, which has a hard button in the center and soft buttons on the corners. The S7 Active has the look and feel of its predecessor, the Galaxy S6 Active, but the stronger screen protection, added storage and faster processor make it superior overall. The smartphone runs on a Qualcomm Snapdragon 820 chip, a 64-bit chip with an integrated LTE modem. It has 4GB of RAM, and an SD card slot allows for extra storage up to 200GB. Another cool feature is the S7 Active's fatter, 4,000 milliamp hour battery, which is better than the 3,000 mAh battery in the Galaxy S7. That gives the handset longer talk and idle time, but also adds to the thickness of the device. Wireless features include 802.11ac Wi-Fi and Bluetooth 4.2. The S7 Active also can be used with the Gear VR headset to roam virtual reality worlds. I was also told it will work with the Gear 360 camera to shoot stereoscopic video. Variants of the Galaxy S7 Active could be available at a later date in other countries, though it's not certain when, a Samsung spokesman said.